Going out today for some shopping. First i went to the Gimsel. I was curious about an alternative for cleaning my ears and for non plastic waste bags. Someone was filling the rows in the health and skin care area, i asked her about it. She showed me a liquid ear cleaner and an ear candle. Both were really not to my liking. I did get compostable waste bags. Small ones. Since i have not that much litter anymore, i can do with this small bag for a week or two, three. My plastic goes in the plastic container, paper in the paper one, glass in the glass one, and vegetable and catty litter stuff goes in the compost heap. Such a great difference with a year ago! I went to the Albert Heijn next. 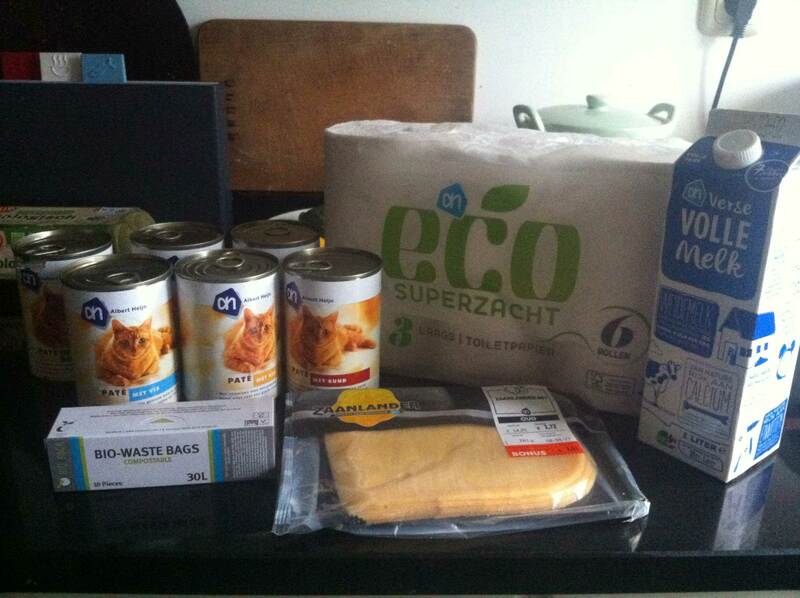 Full milk for my oatmeal porridge, old cheese with a bonus, eco toilet paper and six tins of cat food. I’m gonna make me a rye sandwich with some cheese with mustard next. Yum!